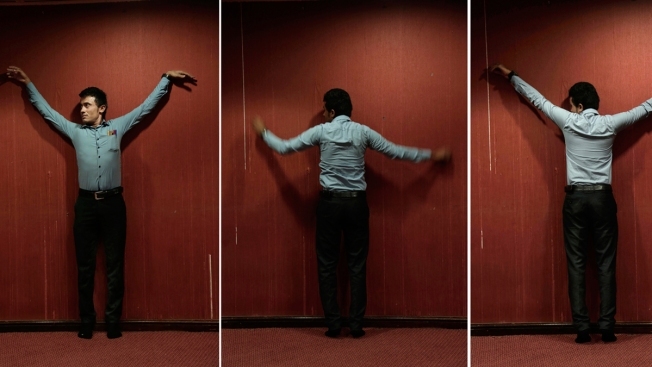 Yemeni medic Farouk Baakar demonstrates how he was shackled to a wall during his torture in a prison run by Yemen’s Houthi rebels, in this combination of three photos taken on July 29, 2018 in Marib, Yemen. The Abductees' Mothers Union, an association of female relatives of detainees jailed by the Houthis, has documented more than 18,000 detainees in the last four years, including 1,000 cases of torture in a network of secret prisons, according to Sabah Mohammed, a representative of the group in the city of Marib. But international outrage over the bloodshed in Yemen has largely focused on abuses carried out by the U.S.-backed and Saudi-led military coalition fighting on the side of the Yemeni government. The AP has exposed torture at secret prisons run by the UAE and their Yemeni allies and has documented the deaths of civilians from strikes by drones in the United States' campaign against al-Qaida's branch in Yemen. From the capital, Sanaa, the Houthis rule over around 70 percent of Yemen's 29 million people. The Houthis believe they are the descendants of the Prophet Muhammad and, as such, have a divine right to rule Yemen. Those who oppose them are "God's enemies," worthy of punishment. In response, the U.S.-backed coalition launched its campaign to restore Hadi's internationally recognized government and thwart what Saudi Arabia and the United Arab Emirates claim is an attempt by Iran, the Houthis' ally, to take over. Internally, a moderate faction of Houthi leaders acknowledged abuses and sought to put an end to them. The leader's brother, Yahia al-Houthi, set up a committee in 2016 to investigate reports of torture and indefinite detentions, and helped free 13,500 prisoners in its first three months. At daylight, he tried again to move, but failed. "Help me," he screamed. Militiamen dragged him into a cell. Only then did he realize he was paralyzed. He had no one to talk to, no one to take him to the bathroom. He urinated and defecated like a newborn baby.